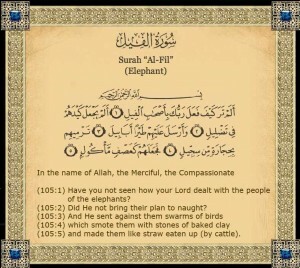 This Surah, as its name indicates, refers to the well-known historical event. Allah protected the Ka’aba against the attack of the army of pagans who, riding on the backs of elephants, came from Yemen intending to destroy it. Its remembrance is a warning against the proud, arrogant pagans to make them aware that they have no power to stand in the way of the Power of Allah, Who destroyed that great army of elephants by little, tiny birds who pelted them with ‘small stones of petrified clay’ and He can punish these stubborn oppressors, too. Their equipment was no more than that of Abrahah nor did the number of their fighters match his. In other words, they had seen that event with their own eyes and yet, were so arrogant. It is obvious that these magnificent, abundant bounties and rewards are for he who, with its recitation, gets down from the horse of arrogance and goes on the right path along side which he seeks the satisfaction of Allah.